The Tracker Team spent the last week working on individual projects to improve the product. This post is the first in a series about what we did, and how it went. 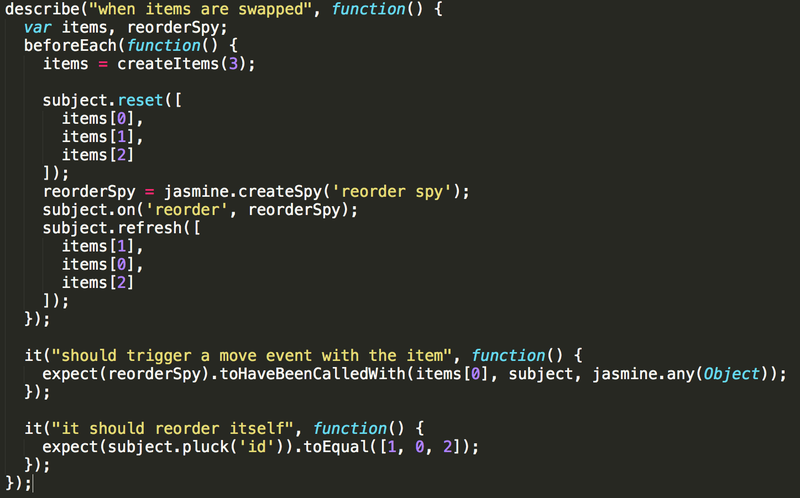 We at Tracker use TDD on a daily basis to make sure the code we write is correct. We are generally pretty strict in practicing TDD, which helps catch bugs in code that appeared to be trivially correct. Because of this relatively few bugs make it past our engineers to our testers, and fewer still make it to production without notice. A few months ago we rewrote portions of our rendering system for performance reasons. We changed from a “chunking” system where multiple stories were rendered together, to a smarter system that turned differences in arrays into the minimal viable set of DOM operations. Our new system had sufficient tests, and performed well in simple scenarios like dragging and dropping stories. But when it came to more complicated changes like re-ordering a panel, it scrambled the results in unpredictable ways. How could this happen with such thorough test coverage? See the issue? There’s no real guarantee that a given test is exercising a sufficiently unique ordering of operations inside the subject. It’s up to the engineer to look at the tests and determine if they are covering all possible cases, which is a very difficult task. Rather than hardcoding values like [1, 0, 2], we use the provided data to drive the assertions. In this case it’s as simple as sorting the random IDs and expecting the array diffing algorithm to end up with the same order as us. The test runner also performs what is known as “shrinking. Upon finding failing cases, the suite attempts to combine and modify the failing data in various ways to find the minimal failing case. This makes it incredibly easy to reproduce failing cases in a different environment. 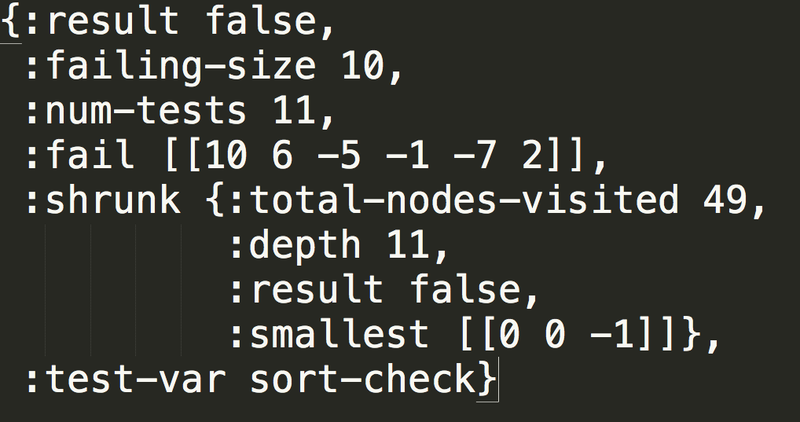 ClojureScript found 10 failing cases, which it managed to shrink down to [0 0 -1]. At this point I could either copy this data into the existing unit testing suite, or use the error messages from “is” (not shown) to hunt down the bug manually in the ClojureScript REPL. I don’t think generative tests will ever replace unit tests. They require more thought to write, and can be tricky to run if your tests require an extensive or fragile setup. But I do think that generative tests can make a great complement to an existing unit testing suite because they are excellent at finding testing cases that you missed. And an extensive generative test suite alongside a strong unit testing suite can provide even more confidence in the correctness of your code.